This wonderful terraced cottage rests in the heart of Winchcombe and can sleep four people in two bedrooms. 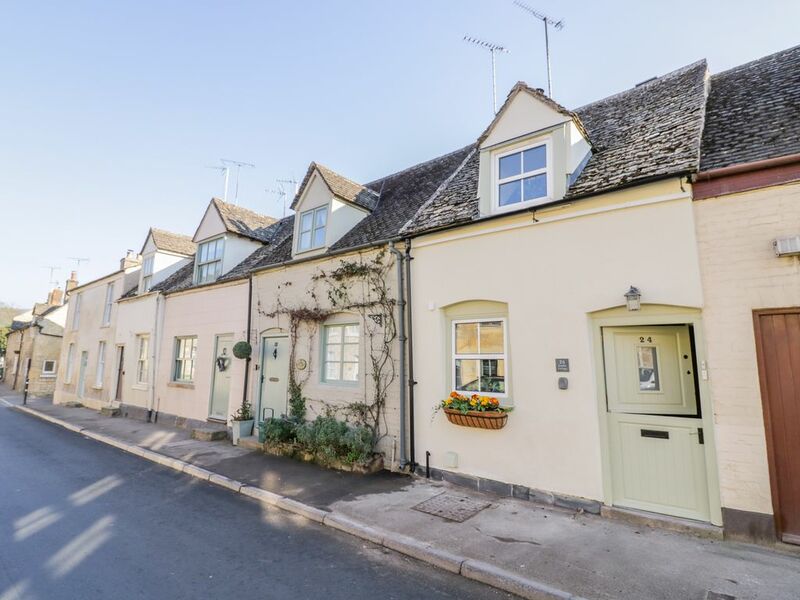 Bumble Cottage is a charming terraced dwelling located in the centre of the Cotswolds town of Winchcombe. The interior comprises of two bedrooms, a double and a twin, sleeping four altogether. There is also a shower room, ground floor cloakroom, an open-plan living room with kitchen, dining area and sitting area as well as a sitting room with woodburning stove. Outside is roadside parking opposite cottage and a lawned garden with patio and furniture. Bumble Cottage offers just the holiday you require to feel fully refreshed. Amenities: Gas central heating with woodburning stove. Electric oven, gas hob, microwave, fridge, freezer, washer/dryer, dishwasher, 2 x Smart TV with You View, selection of books and games. Fuel, power and starter pack for fire/stove in rent. Bed linen and towels inc. in rent. Roadside parking opposite cottage. Lawned garden with patio and furniture. Unfortunately no dogs sorry. Sorry, no smoking. 5 minute walk to shops, pubs and restaurant. Only a 5 minute walk to Winchcombe. Note: Street parking available, with free parking also 0.3 miles from cottage. There are 2 further car parks in the town nearby. Town: Winchcombe lies above the River Isbourne, midway between Cheltenham and Broadway. You can sample an array of local produce in the town's restaurants, wine bars, tea shops and deli's, or stroll around the local shops along the three main streets.The town also plays host to music and arts festivals, country shows and farmers’ markets. You also have access to Cheltenham, Gloucester and many Cotswold towns and villages in the area. Two bedrooms: 1 x double, 1 x twin. Shower room with shower, basin and WC, ground floor cloakroom with basin and WC. Open-plan living room with kitchen, dining area and sitting area. Sitting room with woodburning stove. Gas central heating with woodburning stove. Electric oven, gas hob, microwave, fridge, freezer, washer/dryer, dishwasher, 2 x Smart TV with You View, selection of books and games. Fuel, power and starter pack for fire/stove in rent. Bed linen and towels inc. in rent. Roadside parking opposite cottage. Lawned garden with patio and furniture. Unfortunately no dogs sorry. Sorry, no smoking. 5 minute walk to shops, pubs and restaurant. Only a 5 minute walk to Winchcombe. Note: Street parking available, with free parking also 0.3 miles from cottage. There are 2 further car parks in the town nearby.